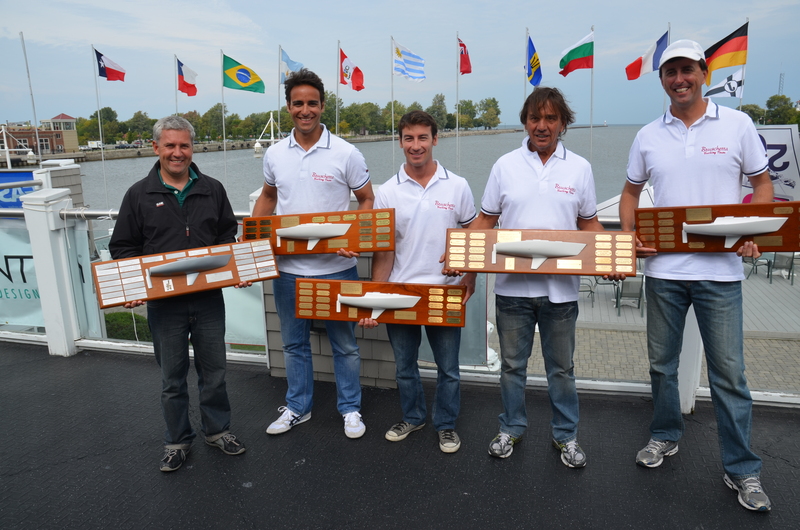 1) Four-time J/24 World Champs…congratulations! What was your strategy coming into this year’s event? How did you prepare? 2) Tell us about each member of the team and his role/contributions to your team work as a whole. A: Team Bruschetta was born in 2003 but the “winning” configuration only started at the worlds in 2006. The “official team” today is: Maurico Santacruz (helm), Daniel Santiago (trimmer) Alex Saldanha (me-tactics), Paolo Boido (mast) and Alfredo Rovere (bow). However it’s very hard to have everybody available all the time and to have money to have the original team all together, so from time to time there are a few changes at the mast and bow (mostly). Good thing is that we found replacements that do not jeopardize the team’s performance at all! For this Worlds, we had Sergio Bittencourt at the mast performing a KEY role maintaining the team spirit up sky high–it is amazing how this guy keeps us laughing all the time with his fantastic jokes and stories!! On the original formation, we have: Mauricio – steering (with fantastic starts!!) and developing the sails…without him there would be no new sails for the most important events. Daniel Santiago – an amazing trimmer and responsible for tuning the mast… he´s got all the numbers on his head, and it is very easy to switch gears when needed. He is also responsible for diving and cleaning the bottom regardless of the temperature (very important!!) and organizing sponsors and trips. Alex Saldanha (me) – I call the tactics and jump from one side to another…I’m also responsible for all trips planning (together with Daniel) and communication. Paolo Boido (mast) – Paolo is a Myth!! This guy is amazing!! Not even going to talk about the perfect boats he builds…but his organization skills are amazing! When we walk in the boat, everything is well organized, clean, dry. His truck…everybody knows his truck!! His jokes…this guy is incredible!!! It is like a father to us!!!! Alfredo Rovere (bow) – the best bowman I have ever seen…also very good on putting the boat together, doing splices, wood and fiber work, AND, most important of all, helping me with tactics!! Yes… he is a very, very good sailor too!!! 3) You raced a boat from 1980. How do the older boats compare to newer ones? A: Yes… she was a “lady”… a 32 years old one with a teenager look!! This boat was completely refit with perfect bottom, keel and rudder – nice job by John Enwright. If you spend some money and A LOT OF TIME to do a complete overhaul, I don´t see why an old boat cannot be as competitive as a new one. HOWEVER, I have to be honest…. as my good friend Rossi Milev would say, there is nothing like sailing on a brand new boat! It is a “plug and play” sensation… it´s awesome! And we need new boats for the Class to grow! So, if you can, without a doubt, buy a new boat!!! 4) What was your opinion of the venue? A: As I said before, Rochester is a fantastic place. We sailed there back in 2006 during the North American Championship. At that time we had the “run of our lives,” blowing 40 kts of wind and sailing downwind with our kite up! I remember we went from top 20s to top 5 on a single leg!! That was incredible!!! Now during the Worlds was a completely different game…we have never sailed in such a difficult condition in all our lives!! It was the worse tactician´s nightmare!! 20-30 degrees shift with huge wind holes….OMG!!! I had such a headache every day after racing!!! Not to mention the “washing machine” effect due to the waves and boats! 5) How did you maintain such consistency all week – in a variety of conditions and in such a large fleet? 6) What was your approach to starts in a 96-boat fleet? A: That’s an easy one…first you decide where you want to start as if there was no boats on the water. Then you start looking where all the good (and local) guys are, just to make sure you made the correct decision. Then with 3 minutes to go you start looking at the fleet movement to see if the place you chose will get crowded or not. Then, if that is a no penalty start, and if there is enough space, you go for the big start. Otherwise you just try to start as near as possible from where you chose on a free spot – this is what happened 98% of the time during the Worlds!! 7) Did you like the “open” format of this year’s Worlds? 8) Will you be defending your title in 2013 in Ireland? A: FOR SURE we will do everything within reach to go, after all – KEN READ, watch out – we are getting there!! But unfortunately for us, it´s always a last minute decision as gathering money for those trips is always a nightmare and uncertain.